Synth Fuel Vol. 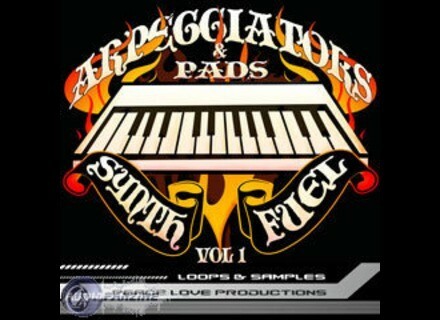 1, Synthesizer Sample from Peace Love Productions. 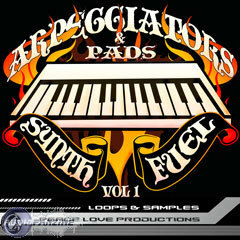 Peace Love Productions releases Synth Fuel Vol. 1which focuses on Arpeggiations and Pads. The Arpeggiators folder is 131 files deep and includes both leads and bases. Each Arpeggiator loop was recorded at 110 BPMs and sustained for a minimum of four measures in 4/4 time and performed in two octaves (two of the following three: A1,A2, & occasionally A3). The purpose of this structure is to give you more flexibility of use within your software application of choice. The Pads folder is 50 loops deep using the same structure. There is a slight difference here and it is that each pad loop is performed in both a major and minor triad where as the Arpeggiators are all sustained single notes. All of the Arps and Pads have a root note of A at various octaves on the keyboard with a majority at A1 and A2. Next there's the SFX folder. This folder contains 10 Sound Effects such as builds, swooshes, transitions, bleeps, and sweeps recorded at 110 BPMs. Now let's move on to the Synthworks folder. This folder is 45 loops recorded at both 100 and 110 BPMs. Synthworks is a bonus selection of Arpeggiations and simple lead performances all with a root not of C. Some beats have been thrown in for good measures. * 445 Acidized .wav Loops. Predator and BLUE for Receptor updated The Receptor compatible versions of Rob Papen's BLUE and Predator have been updated and are now available for download for Receptor owners on Plugorama. DSK Music AkoustiK GuitarZ [Freeware] DSK Music has released yet another free VST instrument for Windows. Ableton Live 7.0.9 Ableton has updated Live to v7.0.9.